A low-calorie vegetarian diet and a low-calorie Mediterranean diet can achieve similar outcomes in terms of reductions in body weight, body mass index (BMI), fat mass and HDL-cholesterol levels, new research suggests. However, an Australian expert has challenged the study’s assertions that the two dietary approaches are equivalent in terms of reducing cardiovascular risk. Writing in Circulation, researchers presented data from a randomised, crossover trial comparing the effects of a three-month low-calorie vegetarian diet and a three-month low-calorie Mediterranean diet in 118 overweight omnivores. The vegetarian diet excluded all animal flesh, including fish, but included dairy and eggs, whereas the Mediterranean diet was based on portion sizes recommended in the Italian Recommended Dietary Allowances. Participants on the vegetarian diet lost a mean of–1.88 kg in body weight,–0.64 kg/m2 in BMI and –1.23 kg of fat mass, whereas those on the Mediterranean diet lost a mean of –1.77 kg of body weight, –0.67 kg/m2 in BMI and –1.46 kg in fat mass. The differences between the two groups were not significant. Levels of LDL-cholesterol decreased significantly with the vegetarian diet but not with the Mediterranean diet, particularly in men, those aged over 50 years, nonsmokers, those with sedentary lifestyles and obese participants. Triglyceride levels decreased significantly with the Mediterranean diet but not with the vegetarian diet. 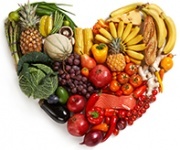 Both diets were associated with significant improvements in participants’ cardiovascular risk profiles, with 44.2% of participants in the vegetarian diet phase and 34% of participants in the Mediterranean diet phase reaching target values recommended by the European Society of Cardiology. However, cardiologist Associate Professor David Colquhoun, from The Wesley Hospital in Brisbane, said the study’s results did not necessarily correlate with the more important outcomes of reductions in heart attack, stroke and cardiovascular death. He also pointed out that not all vegetarian diets were equal. ‘In those countries where a large proportion of the population have a vegetarian diet, there is not a good correlation at all with lower rates of heart attack and stroke,’ he told Cardiology Today, giving the example of India where 50% of the population was vegetarian but their heart disease rates were significantly higher than those in people living in Australia. Professor Colquhoun said the strongest evidence of dietary impact on cardiovascular risk was found in trials of the Mediterranean diet, which included fish and small amounts of lean meat. ‘Go with a proven diet, which has been proven on “intention to eat”, that can lead to significant decreases in heart attacks, strokes and death,’ he advised.